Basalt Chopped Fibers can be mixed directly into polymers and concrete to increase tensile strength, reduce cracking and chipping. Perfect for mortar and concrete reinforcement applications; all decorative applications as countertops, fireplace surrounds. 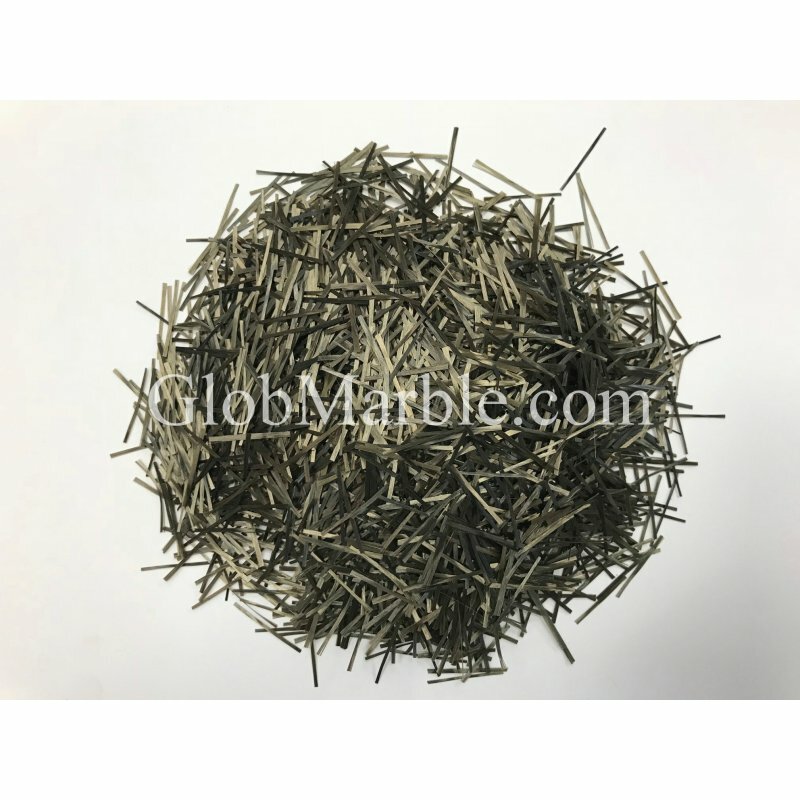 Basalt Fiber has a similar chemical composition as regular glass fiber but Basalt Fiber has better strength characteristics, and unlike most glass fibers is highly resistant to acidic and salt attack and alkaline, making it a good option for concrete, bridge and shoreline structures. • Fiber lengths are available in 12 mm, 18 mm and 24 mm / .47", .70", .94"
• Ductility index of basalt fiber reinforced concrete increases by a factor of 2~4. - Higher sound insulation properties than e-glass fibers. How are Basalt Chopped Fibers made? Qualified* basalt rocks are broken into small pieces, washed, then melted in 1,888-degree F furnaces. The melted rock is drawn down through special bushings to make fiber filaments. The fibers are then chopped into various sizes. Coatings are applied to make the fibers bond to concrete or resins. All-natural rock basalt fibers are safe, non-respirable and do not burn. *Not all basalt is equal! The basalt has to have the right combination of silicate minerals. We recommend 6-8 pounds of basalt chopped fibers per cubic yard of concrete. Fiber content varies but is generally approximately 3% to 7% of the cementitious material weight or 1% to 3% by total concrete weight. Increased fiber content adds strength but decreases workability.